If you really want to experience what paradise is like, there should be a boat tour in your future Riviera Maya vacation plans. Sparkling blue waters, white sand beaches, fantastic resorts, thriving coral reefs, and tranquil hidden coves make for an amazing day in the Mayan Riviera. We offer the best prices and best selection on boat tours in the Riviera Maya - see below for some suggestions! THE BEST PRICES ON BOAT TOURS IN THE RIVIERA MAYA! Snorkeling Adventures - Head out for a day in paradise, snorkeling on coral reefs, watching beautiful tropical fish. Small boat tours, party boats, island adventures, speedboat tours, and our personal favorite, catamaran sailing. Nothing quite feels so much like paradise as sailing silently on a catamaran along the shores of the Riviera Maya. Sunset Cruises - These are awesome things to do in the evening. Booze cruises, party boats, romantic sunset sailing, and more. Island Adventures - Isla Mujeres, Isla Contoy, Cozumel... take an excursion to an island paradise, all departing from Riviera Maya. 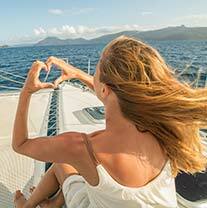 Private Yacht Charters & Catamarans - Great for private groups, or just for that romantic or family getaway. Romantic sunset cruises, fun snorkeling trips, booze cruises, catamarans, yachts, fishing boats, speedboats and more. We have the best prices in Riviera Maya on all of them! Ecotours and Wildlife - Small boat tours through pristine wetlands, or out to sea to swim with whale sharks, these are off-the-beaten-track adventures. Speedboat Adventures - Drive your own personal speedboat or let us do the driving! Check out the ATV & Speedboat Adventure! Deep Sea Fishing - A great excuse to get on the water in Riviera Maya. We have private and shared trips available. That's a brief introduction to the Riviera Maya boat tours - don't miss out on these, they may be the highlight of your vacation!